Abundant and diverse wildlife help people in many ways: for example bees pollinate plants, birds and mammals disperse seeds, bats control pest populations, and both plants and animals have produced life-saving medicines and technological advances. But how could howler monkeys save people from a Yellow Fever outbreak? A new study in the open-access journal Tropical Conservation Science explores the link between howler monkeys, mosquitoes, and humans during a recent yellow fever outbreak in the state of Rio Grande do Sul, Brazil. Spread by mosquitoes, yellow fever led to the deaths of 2,000 howler monkeys in the Atlantic Forest, including two separate species—the black-and-gold howler monkey (Alouatta caraya) and the brown howler monkey (Alouatta guariba clamitans)—and seven people in 2008 and 2009. However, the howler monkeys may have saved lives, according to the paper. Very sensitive to yellow fever, howler monkeys usually die after only a few days of infection. This alerts local health services to the spread of yellow fever, allowing time for human inoculation. 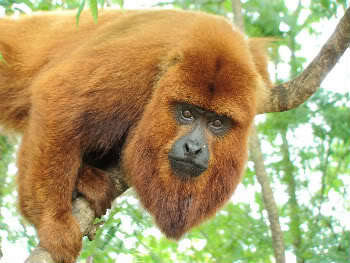 Adult male brown howler monkey. Photo Julio Cesar Bicca Marques. However, during the outbreak misinformation spread by the media led some people to blame the howler monkeys and poison them. The media both directly and indirectly linked howler monkeys to yellow fever, despite the fact howler monkeys are not responsible for the re-emergence of yellow fever in the region or its transmission: mosquitoes and humans are the most probable transmitters. In addition, killing howler monkeys is illegal, since both species are considered threatened in Brazil by deforestation, fragmentation of habitat, hunting, and the pet trade. Yet, the authors believe a significant portion of howler monkeys were not killed by disease, but by humans who put out poisoned fruits for the unsuspecting primates. The research indicates that approximately “40% of these howler monkeys did not die of yellow fever and were likely killed by misinformed people. Considering that most cases in which people kill the monkeys are probably not reported to local health and environmental officers (this is an illegal activity in Brazil), we consider this to be a conservative estimate of both the number of monkeys that died and the proportion of animals likely killed by people,” the authors write. In response to the unfortunate killings of howler monkeys, researcher and lead-author J. C. Bicca-Marques set up an online campaign called ‘Protect our Guardian Angels’ to inform the public of the real role howler monkeys play in a yellow fever outbreak. They act as a “disease sentinel,” the authors explain, providing an “early warning for health authorities”. Given this “howler monkeys play a critical role in helping to avoid the re-urbanization of the disease and are essential for protecting people living in areas where the virus is circulating, but who are not or cannot get immunized,” the authors explain. 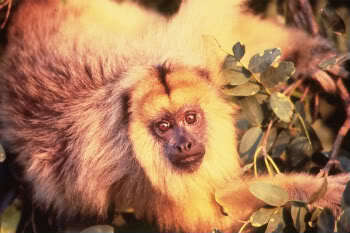 Female black-and-gold howler monkey. Photo by: Julio Cesar Bicca Marques. The ‘Save our Guardian Angels’ campaign was endorsed by twenty-two organizations, including educational, scientific, government, religious, and NGOs. While the media received the message, conservationists found that the information did not reach people in deep rural areas. To avoid the problems of the last yellow fever outbreak, the paper recommends that more investment be made in yellow fever vaccines and inoculation campaigns, better protection for howler monkeys, and the eradication of microhabitat in urban areas where yellow fever-carrying mosquitoes could thrive. “Protecting howler monkeys is not only a matter of biodiversity conservation, it is a matter of public health,” the authors conclude. Citation: Bicca-Marques, J.C. and Freitas, D.S. 2010. The role of monkeys, mosquitoes and humans in the occurrence of a yellow fever outbreak in a fragmented landscape in south Brazil: protecting howler monkeys is a matter of public health. Tropical Conservation Science Vol. 3 (1):78-89. (04/22/2009) There have been numerous reports of howler monkeys poisoned in the southernmost Brazilian state of Rio Grande do Sul due to misinformation regarding the monkeys and the yellow fever virus. Some locals believed that the monkeys, which also suffer from yellow fever, were in fact the disease-carriers, but yellow fever is carried by mosquitoes not monkeys. 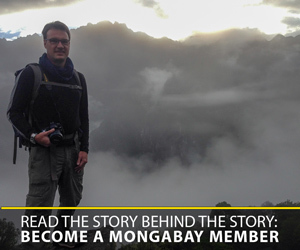 A new campaign headed by Dr. Julio Cesar Bicca Marques wants to set the record straight. The campaign, entitled ‘Save Our Guardian Angels’, is working to inform the public of the actual and important role of howler monkeys in yellow fever outbreaks. (03/29/2010) Approximately thirty monkey species inhabit the tropical forests of Colombia with at least five found no-where else in the world. A new review appearing the open access journal Tropical Conservation Science of Colombia’s primates finds that a number of these species, including some greatly endangered species, have been neglected by scientists. The researchers looked at over 3,500 studies covering over a century of research by primatologists. (03/29/2010) Brazil’s golden-headed lion tamarin is a small primate with a black body and a bright mane of gold and orange. Listed as Endangered by the IUCN Red List, the golden-headed lion tamarin (Leontopithecus chrysomelas) survives in only a single protected reserve in the largely degraded Atlantic Forest in Brazil. Otherwise its habitat lies in unprotected patches and fragments threatened by urbanization and agricultural expansion. Currently, a natural gas pipeline is being built through prime tamarin habitat.